Situated awkwardly in the heart of rolling green English countryside is the United States’ largest overseas intelligence station. 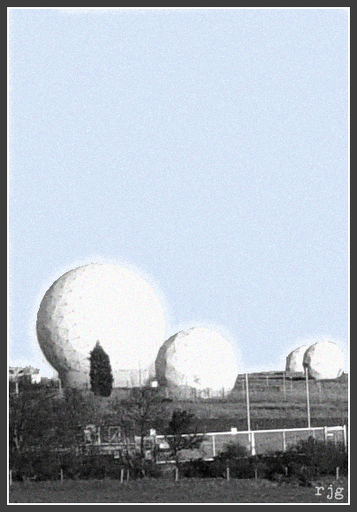 Surrounded by farmland and sheep, hundreds of National Security Agency staff go to work every day at RAF Menwith Hill, where they eavesdrop on communications intercepted by satellite dishes contained in about 30 huge golf ball-like domes. Used by the NSA since the 1960s, Menwith Hill is an important spy center. But there is growing disquiet in Britain over whether intelligence gathered at the base is being used to help with the CIA’s controversial clandestine drone strikes. And the government is keeping mum. Earlier this month, Ken Macdonald, former chief prosecutor for England and Wales, spoke out on the subject in an interview with the London Times. He told the newspaper he believed there was compelling evidence that Britain was providing the United States with information subsequently used to help with drone attacks in countries like Pakistan. Because the United Nations says that the CIA’s covert drone campaign possibly violates international law, the allegation was politically explosive. The implication is that the British government could itself be complicit in unlawful drone bombings, which in Pakistan alone since 2004 have killed up to an estimated 3,337 people, among them hundreds of civilians. What goes on inside the Menwith station is impossible to know for sure. However, according to a 2001 European Parliament report, it is part of a surveillance network called ECHELON, situated to intercept communications routed over the Indian and Atlantic oceans. Former NSA employee Margaret Newsham, who worked at Menwith Hill 20 years ago, told CBS it monitored Russian and Chinese communications (but on one occasion spied on U.S. Sen. Strom Thurmond). And the Federation of American Scientists has claimed it is capable of intercepting an astonishing two million communications an hour. If these reported capabilities are correct, it seems highly plausible that the base’s satellites are today intercepting at least some communications from the Middle East — which could help how the CIA picks its targets for drone strikes in countries such as Pakistan, Yemen and Somalia. This brand of intelligence-led warfare has already led Germany to limit information it shares with the United States. The British government, however, does not take the same position — and is contributing to the secrecy that surrounds drone operations. Fabian Hamilton, a member of the British Parliament, asked the government earlier this month whether Menwith Hill plays a role in the planning and deployment of drones in Afghanistan, Pakistan, Yemen, and Somalia. The response? He was not permitted to know. “For operational and security reasons we do not comment on the specific activities carried out at RAF Menwith Hill,” said Andrew Robathan, minister of state for the armed forces. The secrecy is a problem, for basic democratic reasons if nothing else. It’s obvious that the British government wants to protect Menwith Hill’s activities on national security grounds, which might be justifiable to some extent. But if a foreign military is using a base in the English countryside to help conduct covert wars in far-flung lands, that’s a different matter altogether — and surely the British public has a right to know about it.